We continue to create thousands of Safe, Trustworthy, Attentive, and Responsible drivers–STAR drivers–through our programs every year. We don’t just talk about our curriculum and instructors, we walk the talk with our Ticket Free Guarantee! Not only are we just saying we are the best, we are prepared to back up that statement. We guarantee to cover the cost of online point avoidance/ticket reduction program or juvenile driver improvement (Ohio) of All Star graduate student that receives a ticket within their first year of obtaining their driver’s license. An eligible student is one who went through our entire GDL (Graduated Driver Licensing) system (those that only took a portion of their GDL license from us, are not eligible) starting as of January 1st of 2016. Our records will confirm if a student has/hasn’t taken their entire GDL from All Star. 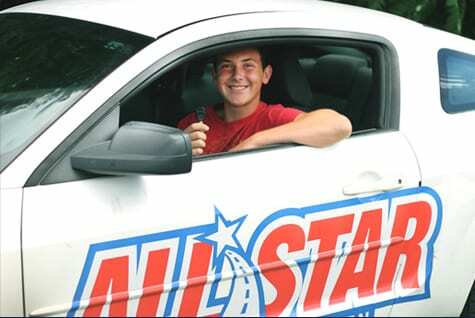 The All Star Ticket Free Guarantee one year timeframe begins the day the student receives their driver’s license, through one year thereafter. To be eligible for the refund, the moving citation offense must be one that is eligible for an online point avoidance/ticket reduction program/juvenile driver improvement (Ohio). In some states you will receive a note stating that you are eligible to take the course. You may also need to check with law enforcement or judge to see if you’re eligible if you do not receive a note from the state. If the moving citation offense is one that the courts will not allow to take point avoidance/ticket reduction program the student is not eligible for refund from All Star. Your license is valid with two points or less on it when receiving said ticket. The ticket received is the driver’s second offense that year. Must only be the first issued ticket. After your initial contact with All Star Driver Education’s corporate office regarding the redemption of the All Star Ticket Free Guarantee (address provided below) proof must be shown that the student did finish and pass the point avoidance/ticket reduction class. Once that proof has been shown a refund check will be sent out to you.